Cristiano Ronaldo officially became Real Madrid’s all-time leading goalscorer by scoring in Saturday’s comfortable 3-0 victory over Levante at the Santiago Bernabeu. Ronaldo has now scored 324 goals in 310 games with Real making him the: Greatest Of All Time. 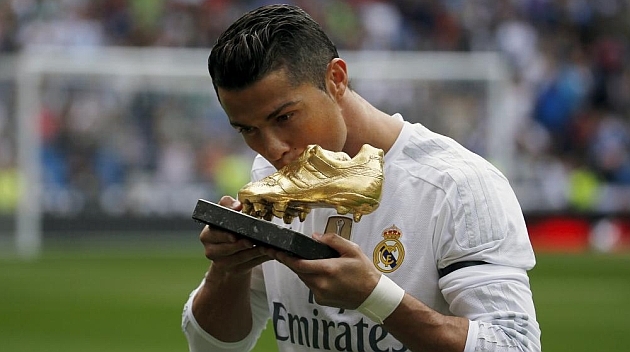 Before the start of the match Ronaldo shared his fourth Golden Shoe (2008, 2011, 2014 and 2015) with the fans who cheered the player. The Portuguese striker is the only man to have won four awards as the best player in the European leagues, with one more than Argentina and Barcelona forward Leo Messi.